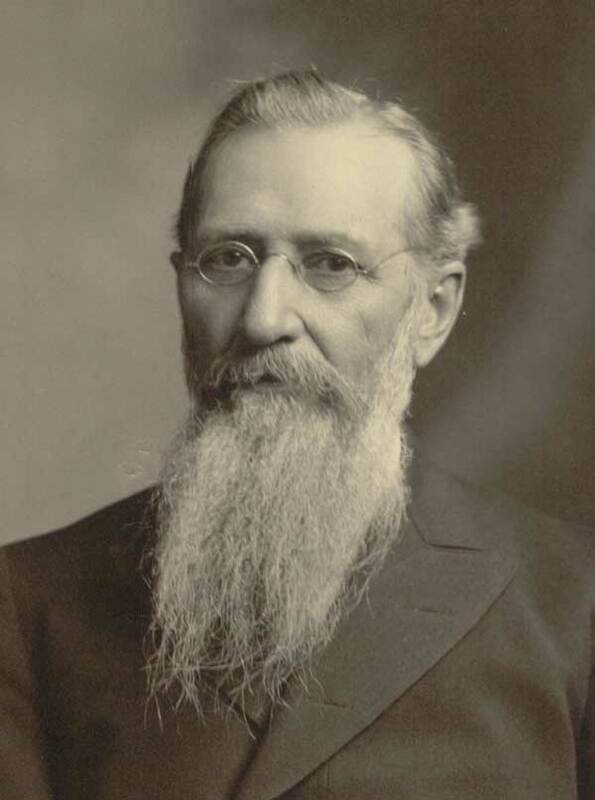 President Joseph F. Smith (1838-1918) was the son of Joseph's brother Hyrum. He was ordained an apostle in 1866 at age 28, and served as a counselor to Brigham Young and the three presidents who followed. He became the 6th president of the Church in 1901, and served until his death in 1918 at age 80. "The particular part that I wish to call your attention to is that which refers to 'entering into the rest of the Lord' (see Moro 7:3. ); not unrest, fear, doubt, and trembling. What does it mean to enter into the rest of the Lord? Speaking for myself, it means that through the love of God I have been won over to Him, so that I can feel at rest in Christ, that I may no more be disturbed by every wind of doctrine, by the cunning and craftiness of men, whereby they lie in wait to deceive; and that I am established in the knowledge and testimony of Jesus Christ, so that no power can turn me aside from the straight and narrow path that leads back into the presence of God, to enjoy exaltation in His glorious kingdom; that from this time henceforth I shall enjoy that rest until I shall rest with Him in the heavens. "I desire to impress this thought upon your minds, for I want you to understand that this is the meaning intended to be conveyed by the words, 'entering into the rest of God.' Let me assure you that that man who is not thoroughly established in the doctrine of Christ, who has not yielded his whole soul unto the Lord, and to the Gospel He has taught to the world, has not yet entered into that rest. He is still at sea, so to speak, wandering, unstable, lacking firmness, lacking the faith that cannot be moved, ready to be overtaken by the cunning and craftiness of him who lies in wait to deceive and mislead into error and darkness. "While he that has received the testimony of Jesus Christ in his heart, he that has yielded his all to the kingdom of God and to the will of the Father, is so established. His heart is fixed; his mind is made up; doubts have been dispelled; fears have all been removed; he knows in whom to trust; he is thoroughly established in his purposes and in his determination that, as for him and his house he will serve God, keep His commandments and walk, as far as it is possible for human creatures to walk, in purity of life, in honor, fidelity, and uprightness before the Lord." Too many face life with "unrest, fear, doubt, and trembling." 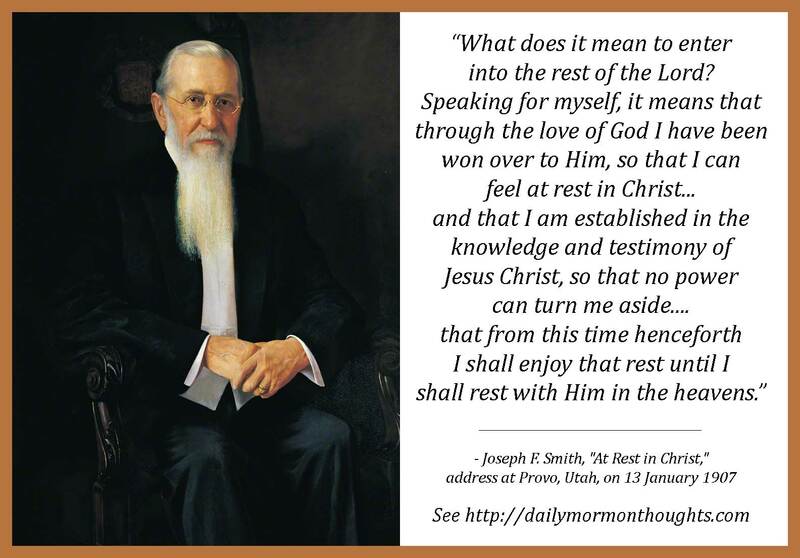 President Smith suggests that's the alternate to living in "the rest of the Lord." When we "rest in Christ" we are at peace, untroubled by the forces of the world around us, moving untroubled through the world's tribulations and the various "winds of doctrine." The key is to be "established in the doctrine of Christ" and to have "yielded his whole soul unto the Lord." So the process begins with learning, studying, pondering the doctrine; and then applying it in a way that brings total devotion. The result is that peaceful state when the man so committed has doubts and fears dispelled, and is committed to God in obedience and service. He then is able to "walk, as far as it is possible for human creatures to walk, in purity of life, in honor, fidelity, and uprightness before the Lord." That's a beautiful and treasured state. The "rest of the Lord" can begin in this life, and not just in the eternities! Labels: adversity, challenges, choices, peace, rest, Smith Joseph F.